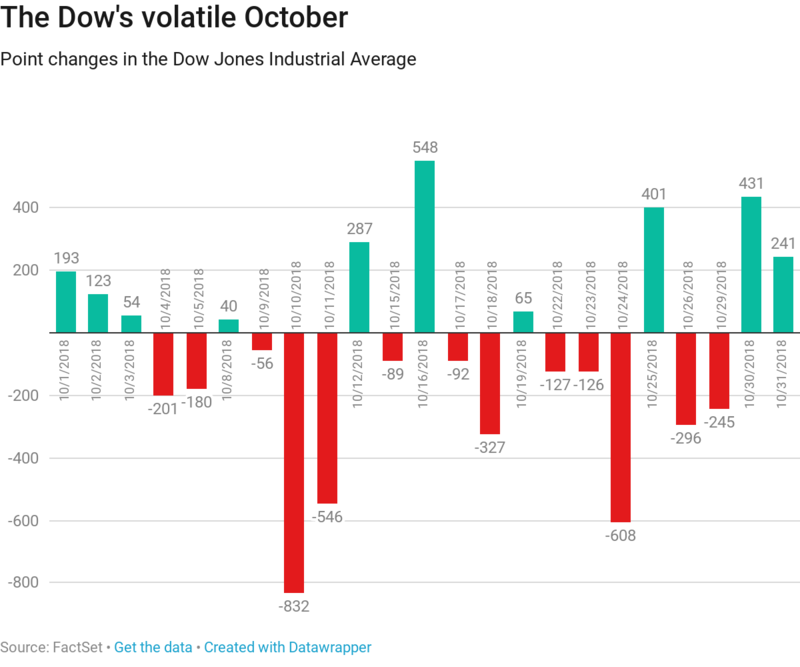 October has been a volatile market for stocks, with the Dow Jones Industrial Average seeing triple-digit moves on many days this month. While stocks have largely recovered from the dramatic drop they experienced earlier this week, they are still down for the month. Now is the time to evaluate your portfolio and make sure your investments match your time horizon and risk appetite. Many investors are breathing a sigh of relief following Monday's market rout and subsequent rally. That doesn't mean you should get too comfortable just yet. Even as the Dow Jones Industrial Average has gained about 650 points in the past two days, it is still down 5.1 percent for October. That makes it the worst month since January 2016. The S&P 500 has dropped 6.9 percent this month, the worst since September 2011. Financial experts emphasize that does not mean you should panic. But you should double check your strategy. "Some individual investors probably are extended in their risk profile," said Mannik Dhillon, president of VictoryShares and Solutions at investment management firm Victory Capital. "Now might be a good time to take another look at your profile and say, 'Am I appropriately aligned in my risk tolerance? Am I appropriately diversified to face this market volatility if it should get worse?'" There are steps you can take to make sure your portfolio is prepared in case wild market swings are here to stay for a while. While you may think you're diversified because you are invested in an S&P 500 fund, that is actually a "heavy bet on technology these days," Dhillon said. "Those types of positions, that's OK, as long as you know and you did that willingly and you understand the risks that come along with it," Dhillon said. Now could be a good time to take a step back and ask yourself, "What does that do for my risk profile and am I OK with it?" Dhillon said. If you're close to or in retirement, you may want to consider tweaking the safety portion of your portfolio. "Typically bonds are a flight to safety," Levine said. "But if interest rates continue to rise, that flight to safety may not be nearly as safe as people think." You may want to add in alternative investments that generally do not move in the same direction as the markets. These are also known as non-correlated assets. They could include farmland, toll road or cell phone towers, said David Johnson, partner at Signature Estate & Investment Advisors. "Even if the market is down today, everyone is still walking around talking on their cell phones," Johnson said. "Those types of alternative assets, non-correlated assets, can help the diversification process." How much you want to allocate to alternatives depends on where you are in life. If you're young, you probably do not need a lot of exposure to these investments. But if you're near or in retirement, these investments can help limit your own ups and downs. "You might not capture the full amount of the upside, in a year like 2017," Johnson said. "But you're also not going to get those extreme lows, as well." Your portfolio should be created to weather market turbulence. "That doesn't mean you're going to enjoy it when you're going through it," said Megan Gorman, managing partner at Chequers Financial Management. "But keep in mind you've got the right weightings to bonds and stocks in alignment with trying to meet a certain need in a volatile marketplace." Now is a great time to stress-test your portolio, Gorman said. In other words, take a look at the worst 12-month period the portfolio has been through and the best 12-month period. Also be sure to look at the 12-month period after the worst 12-month rout the portfolio experienced, Gorman said. "Often, you saw it rebound," Gorman said. "This is where you have to keep in mind that the markets reward patience." While many investors may want to pull out when the market is rocky, it is actually often the best time to invest because stock prices are low. Now is a good time for many investors to maximize their 401(k) contributions, Levine said. "For those investors who are far away from retirement, it's really just about contributing, stay the course and take a long-term view," Levine said. "The most important thing is to not make wholesale changes because the market has gone down."